Heads up Visa Signature Card Holders! If you are planning to go to the movies today, you can get get 2-for-1 Fandango movie tickets to be used today only. The complimentary movie ticket (up to $19.50 including Fandango convenience fee) will automatically be deducted from your order when tickets are purchased. Now worries if you aren’t able to make it to the movies today because this same movie ticket offer will be valid every Friday through 8/8. 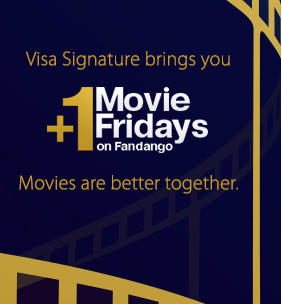 There is a limit of one complimentary movie ticket per Visa Signature card every 30 days. Also, Chase Visa Signature cardholders can take advantage of an extended redemption window by purchasing tickets on Wednesdays, Thursdays, or Fridays through 8/21 for a Friday movie showing.